Lecithin gives better texture and more tender crust to bread and other baked goods. It is a natural emulsifier. 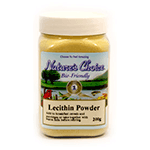 Lecithin is an important component in all human organs, including the brain, heart, kidneys, liver and nerves. For best results, take 1-2 Tbsps daily. As a supplement, add to breakfast cereals and porridges or take together with warm milk before retiring. Please keep refrigerated.